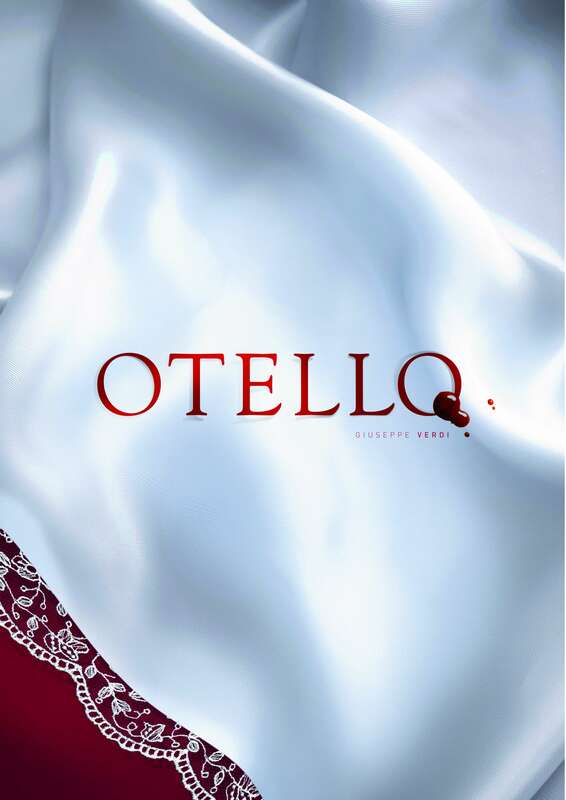 VIVA EUROPA 2013 JUNE 5, in the context of the 2013 European Year of Citizens, consisted in the performance of Verdi's OTELLO on 5 June 2013 at the Palau de les Arts Reina Sofía in Valencia. Regrettably, due to administrative difficulties beyond the control of VIVA EUROPA organizers, it was not broadcast to other European cities, in spite of the willingness and enthusiasm of musicians, artists, patrons and organizers. We want to thank all cities who expressed their interest in participating in this event for their support. 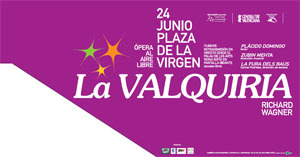 VIVA EUROPA 2012 JUNE 22, in the context of the 2012 European Year of Active Ageing and Intergenerational Solidarity, consisted in the performance of Verdi's IL TROVATORE on 22 June 2012 at the Palau de les Arts Reina Sofía in Valencia. Regrettably, due to financial uncertainties linked to the economic crisis, it was not broadcast to other European cities, in spite of the willingness and enthusiasm of musicians, artists, patrons and organizers. It was sung by Sebastian Catana, María Agresta, Ekaterina Smenchuk, Jorge de León and Liang Li, and conducted by maestro Zubin Mehta. VIVA EUROPA 2011 JUNE 13, integrated as an activity of the 2011 European Year of Volunteering, hosted the live broadcast of Giacomo Puccini’s famous opera TOSCA from Palau de les Arts Reina Sofía in Valencia, under the patronage of Ms Viviane Reding, Vice-President of the European Commission responsible for Justice, Fundamental Rights and Citizenship. The opera was sung by Oksana Dyka, Jorge de León and Bryn Terfel and was conducted by Zubin Mehta. As in previous editions, this cultural event was free of charge for cities and audience. A total of 57 cities from 21 different European countries participated in this third edition of VIVA EUROPA, with around 100,000 people attending the event. VIVA EUROPA 2010 JUNE 18 was part of the 2010 European Year for Combating Poverty and Social Exclusion and received the high patronage of the Commissioner for Employment, Social Affairs and Inclusion, Mr. László Andor. 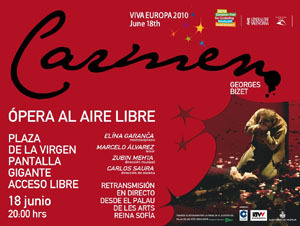 It made possible for 43 cities in 17 European countries to simultaneously share Bizet’s CARMEN live on big screens, sung by Elïna Garanča and Marcelo Alvarez, conducted by Zubin Mehta and staged by Carlos Saura. VIVA EUROPA 2009 JUNE 24 took place during the 2009 European Year of Creativity and Innovation under the patronage of Mr. Ján Figel’, European Commissioner for Education, Training, Culture and Youth. This cultural event consisted in a live transmission of Wagner’s opera DIE WALKÜRE from Palau de les Arts Reina Sofía in Valencia. The performance was played by Plácido Domingo, amongst others, conducted by Zubin Mehta and staged by La Fura dels Baus. The first edition of this major European cultural initiative involved thousands of citizens from different European cities, who could simultaneously enjoy this unique experience.